Tishaura Jones (born March 10, 1972) is the Treasurer of the City of St. Louis, Missouri. She served as a Democratic member of the Missouri House of Representatives from the years 2008 to 2012, representing the 63rd District. Tishaura Jones is the daughter of former St. Louis City Comptroller Virvus Jones. After graduating from Affton High School in 1990, she attended Hampton University, earning a Bachelor's degree in Finance in 1994. In 2001, Jones earned a Master's degree in Health administration from Saint Louis University School of Public Health. Jones' political career began in 2002, when she was appointed Democratic committeewoman of the 8th Ward for the city of St. Louis. Since 2004, Jones has served as Sergeant-at-Arms for the St. Louis City Central Democratic Committee. Jones was first elected to the Missouri House in November 2008, when she defeated Independent candidate Nels Williams, 85.4% to 14.6%; there was no Republican challenger for the seat. Jones ran unopposed in 2010, to win her second term. She made Missouri political history in November 2010, by becoming the first black woman elected to serve as the House Assistant Minority floor leader. In the House, she served on several committees, including Elementary and Secondary Education, Health Insurance, and the Special Standing Committee on Election Contests. When not involved with her legislative duties, Jones was the Vice-President of Public Finance at Blaylock Robert Van, LLC. In 2012, Jones ran for the position of Treasurer of the City of St. Louis. In August, during the campaign, she said that her first step would be to bring in a private auditing firm, calling to get rid of the "ghost workers" and a "total house cleaning". In November 2012, she won the general election, with 78% of the vote. One of the "ghost workers", Fred W. Robinson, was convicted of wire fraud charges and submitting false time sheets, and sentenced to two years in prison. Jones was re-elected to a second four-year term in November 2016, with 76% of the vote. ^ "Representative Tishaura Jones". House.mo.gov. ^ "Missouri House of Representatives". House.mo.gov. 10 March 1972. ^ "Tishaura O. Jones, Currently Elected Missouri State Representative District 63". Vote-mo.org. 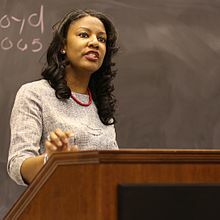 ^ "State Representative Tishaura O. Jones". Tishauraojones.com. 14 March 2008. ^ Hunn, David (8 August 2012). "Tishaura Jones warns of 'house cleaning' in St. Louis treasurer's office". St. Louis Post-Dispatch. ^ "Tishaura Jones makes House history - St. Louis American: Community News". The St. Louis American. 10 November 2010. ^ "Election Summary Report, General Election, St. Louis, Missouri, November 6, 2012" (PDF). St. Louis, MO, Board of Elections. November 20, 2012. Retrieved February 12, 2017. ^ Currier, Joel (17 September 2013). "'Ghost' employee of St. Louis Treasurer's office sentenced to 2 years in prison". St. Louis Post-Dispatch. ^ Hayes, Chris (March 26, 2013). "St. Louis Treasurer's Office Ghost Employee Found Guilty". Fox 2 News. ^ "Chairman of the Board for the Paideia Academy, Employee of St. Louis City Treasurer's Office Convicted on Fraud Charges". Federal Bureau of Investigation. 26 March 2013. ^ "Election Summary Report, General Election, St. Louis, Missouri, November 8, 2016" (PDF). St. Louis, MO, Board of Elections. November 21, 2016. Retrieved February 12, 2017. This page was last edited on 9 October 2018, at 11:11 (UTC).